Doxford Hall Hotel – Spa Review. Emily travels to Northumberland to test out the Aqueous Spa at Doxford Hall Hotel. Is it worth a trip from Yorkshire? As part of our stay at the lovely Doxford Hall Hotel in Northumberland my husband and I book a treatment each in their on-site Imagine Spa. 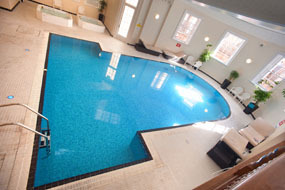 We take advantage of the full use of the spa facilities that come with being hotel residents. I love an afternoon in a spa. But my husband has never been in one, let alone had a treatment. So we have mixed feelings heading down for our pampering sessions. The beauty therapists at Doxford Hall Spa are lovely and friendly. They go through all of the the options we could choose from in detail. This helps my husband make an informed choice. I choose a 60-minute full-body Sensory Body Massage with Lava Stones (£60). He opts for a 60-minute Raindrop Back Massage (£65). Although beforehand he is adamant he will only be having a 30-minute treatment and will meet me in the pool afterwards! As we are a little early we are shown to the changing rooms to get ready. We then wait in their relaxation room until they are set-up. 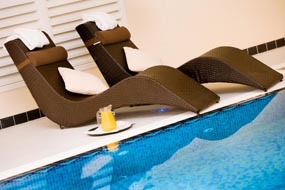 The relaxation room is tastefully decorated and has several reclining lounger-type seats for us to lie on. The tranquil music does help you to de-stress before your treatments. The only downside is the fact that the ladies changing rooms are directly on the other side of the door. So we could hear the large group of ladies getting changed and chatting. This disturbed our relaxation a little. Also, the way out from the ladies changing rooms isn’t well signed. This results in the ladies walking through the relaxation room to get out. A little awkward. Due to my partner’s nervousness about the treatment and the trepidation about the pain of the therapist working on the knots in his back, we opt for separate rooms for our treatments. My therapist is very welcoming and explains the difference between an ordinary full-body massage and one using the lava stones. I’m happy with some fairly firm pressure being applied as I tend to suffer from very tense shoulders. The massage combines traditional moves without the stones first to warm up the muscles. Then the hot stones are used to work deeper into the muscles. They were very smooth and the heat given out by the stones is extremely relaxing. Even when it was a little uncomfortable due to my knots being massaged out. The treatment finishes with an arm and scalp massage that almost sends me to sleep. Always a good sign of a successful treatment. Despite his trepidation, my husband really enjoys his treatment. He even asks to have the full hour instead of 30 minutes. As well as warm oil being used in his massage it is also dripped down his back as part of the Waterfall treatment. He finds it very relaxing. My partner suffers with a bad back after having a few slipped discs and, after explaining this to the therapist, she takes this into consideration. He is left feeling relaxed after a lot of the tension is his back has been relieved. 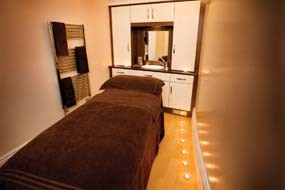 The treatment rooms are luxurious with heated beds that feel like a great treat and help you relax even further. With fluffy towels to lie on and under, tranquil music and high-quality oils that smell amazing, we are left feeling very pampered after our treatments. Next we try the spa facilities. The pool is a generous size for a hotel spa and, luckily, we are the only two using it at the time. Everything is immaculately neat and tidy and there are plenty of loungers to relax on and a small area with tables and chairs. There are two spa baths which may cause an issue during very busy times for those who don’t fancy sharing with other guests. But we do manage to have one to ourselves, which is a bonus. It takes a minute to work out how to turn the bubbles on to transform it from a normal bath to a Jacuzzi. But once we work it out it is wonderful. We also try the steam and sauna rooms which are on the small side but are nice. We prefer the sauna with its traditional aromatic coals and cold water to pour on. This creates a blast of heat which contrasts with the cool pool afterwards. The Operations Manager mentions during our look around that there are plans to refurbish the spa soon. We can definitely see the benefits of expanding the steam and sauna rooms and upgrading the changing rooms. All in all, the spa was of a good standard for a hotel. But it may become a little crowded if the hotel is very busy. The treatments are of the highest quality and they are definitely the highlights of our stay.